One of my favorite breakfasts go-to’s happened to be a mega Superfood. Chia seeds have received great acclaim for delivering a whopping amount of nutrients and antioxidents in each teeny seed. Figuring out how to incorporate them into your diet might be a little tricky, other than the obvious “add to smoothie” advice that I’ve followed for years. That all changed for me when I came across a lovely vegan restaurant in London that served up chia seed pudding. UM, WHAT? Why have I not beeng doing this all my life?! It’s like overnight oats only a MILLION TIMES HEALTHIER! Que the Hallelujah chorus right now. Imma bout to shout it out! Effortless: check. Delicious flavor possibilities: check. Mega healthy: check, check, check. While the seeds themselves don’t have much flavor, when soaked, they plump up and form a gelatinous, pudding like mixture. On it’s own, I don’t find it too appetizing. I actually think the even just the word gelatinous sounds unappealing. BUT wait! Don’t go anywhere yet! I also think plain soaked oats are blah and horrendous, but that hasn’t stopped me from making a long list of way too fabulous overnight oats recipes (thank you Pinterest for being my source of all things domestically inclined). Now, instead of using oats, you can just use chia seeds. 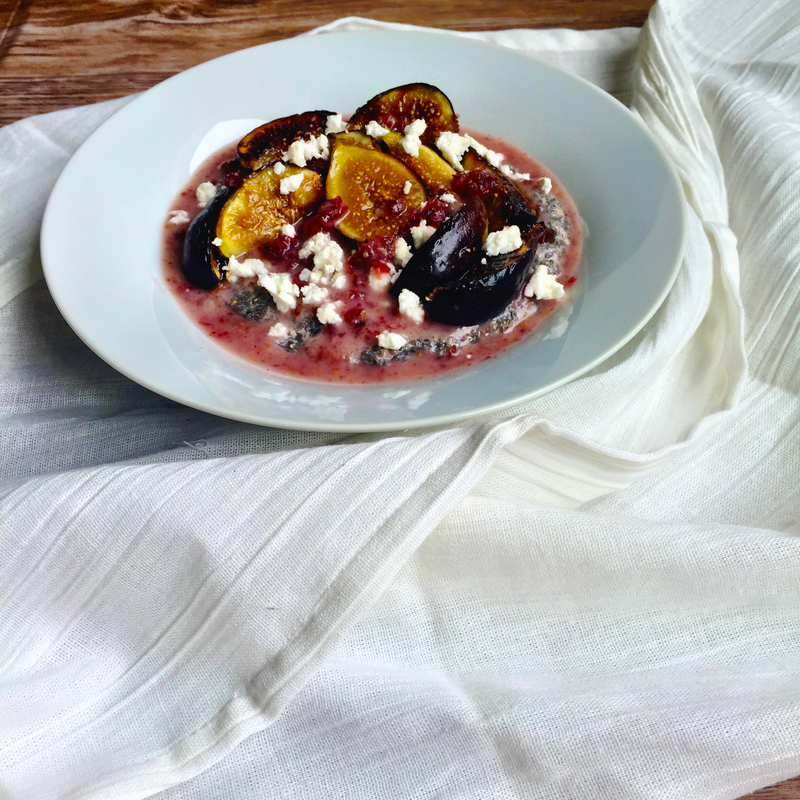 This recipe of roasted figs with a cherry + fig sauce and crumbled goat cheese tasted particularly delicious to me, so I wanted to share it with you. It makes for a wonderful, quick breakfast or healthy mid-afternoon snack. Mix seeds, milk, vanilla and salt in a container that allows enough room for the chia seeds to expand. Leave overnight or soak for about six hours. 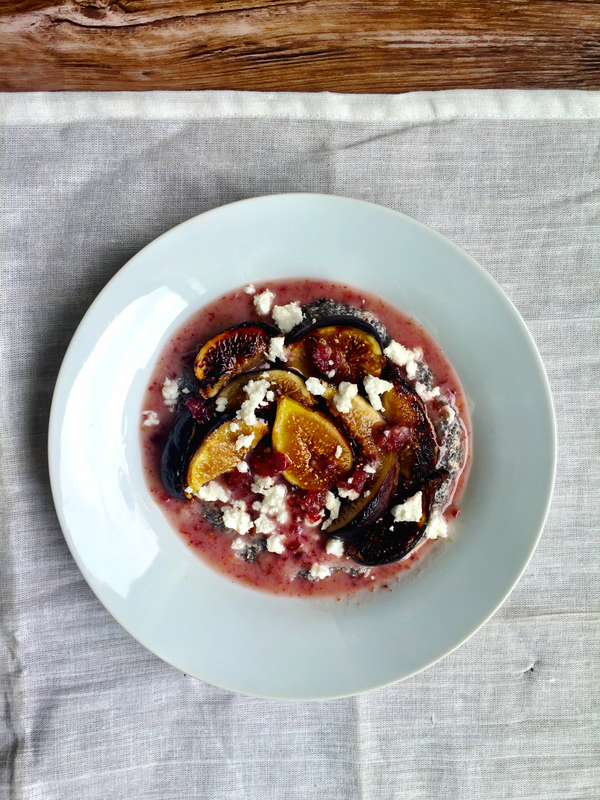 Slice the figs and seer in a pan on medium high to caramelize the fruit and bring out its natural sugars. Top the chia pudding with the fruit and crumbled goat cheese. Add all sauce ingredients in food processor and blend till you reach desired constancy. Pour over chia pudding and enjoy! That’s all it takes to start your day (or your snack!) off with a Superfood bang! Any flavors and fruti you’ve experimented with as you’ve made chia seed pudding? Be sure to let me know about it! Much love and lots of spice! Next PostSmoothie Fail: Is Your Drink Making You Gain Weight?